I QSP' ed your e-mail to PY6HD, he is on the way to the island. probably nov, 2.Now the propagations conditions is going to be better. anche a multipli di 1000 copie, fronte e retro a colori. R-053, R-054, R-055, R-056, R-057 e R-058. are available for quantities multiple of 1000 pieces. R-053, R-054, R-055, R-056, R-057 and R-058. > Is Hotang/YC0IEM in your shack? > If he is so, please tell me his QRV time. > Many IOTA chasers would like to make a contact with him. UA9OBA/N7RO will mail them ASAP. I will let you know when I hear any news from Russia. thank you for submitting your log for the IOTA 2009 contest. We are pleased to announce that we now have the provisional Results (subject to appeal). photographs from 267 stations, and more than a 51% of the stations entered their location using google maps. We have integrated both the maps and photographs on the results page and we hope that they would provide a richer experience. each category and a list of trophy winners will be published in due course. IMMEDIATELY. The results will be finalised by November 1st 2009. Many thanks for your answer and for the help　on divulgating this dxpedition with ur friends. to receive some donations thru the site too. 73 & hope cu soon on the air! The A.R.V.M. is organizing his XII Exposition Ham Fair in Lisboa. proporcionate a nice get together to all OMs. How are you? Hope fine! Maybe you don't remember me but i have been in ZY6T (SA-023)　together with Cris, PY7GK in December-2006. That time, i remember you sent us an e-mail asking for a DXpedition to SA-062 (Coroa Vermelha Isl.) and that is why i am sending this e-mail to you. I know you are an avid IOTA Hunter and maybe you have many friends who also are IOTA enthusiasts in JA so this information may be of interest for you and your friends. Me and a group of friends are going to SA-062 between 11 to 16 of upcoming November. This operation will include Mike, K9AJ an experienced operator being operated from tens of IOTAs including BS7H - 2007 operation. Also other well known PY operators as PY7XC, PY7ZY and PY0FF who had operated many times from PY0S and other IOTAs. Unfortunately Cris, PY7GK could not be with us this time due to job restrictions. HTTP://WWW.PW6C.COM - Please forward this info to other JA's. In ZY6T, we made over 300 QSO's with JA's, also some VK's and ZL's, which made us very proud and happy to give "opportunity to friends on the other side of the world" on working a brand new IOTA island!. Some supporting organization will help us since the budget for this operation is very high and is estimated in USD $6,000. Even thought individual contributors (with any amount) are very welcome as well as donations of other amateur radio organizations with interest on this project. 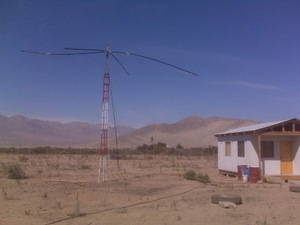 I am sending to you the DXpedition Project attached, please get a look. Please feel free to forward this e-mail to other IOTA hunters. Hello Shu: How are you. Pse tell me when is the IOTA meeting in Japan in 2010.
year. I would like to visit Japan and if there are a IOTA conference is better. This adream for me visit Japan. effort to goin to Tokyo. following day we board Barbarian II. We look forward to contacting you all. on 4-23 October. QSL via IZ8CCW. > I got your OC-070 info this morning. > I am very fine and happy to receive your MSG. > For example, QRV frequencies 21260/14260 and so on. > And I will be QSP to some JAs IOTA chasers. > Please follow you thru me. This email confirms that you have donated £210.00 GBP to Derek Cox using PayPal. will appear on your bill as "PAYPAL *DEREK COX".